In its continuing mission to promote the Bakersfield country legacy of Buck Owens and the Buckaroos featuring Don Rich, Omnivore Recordings will issue two collections that spotlight the town’s most storied musicians: Don Rich’s That Fiddlin’ Man from 1971, and the all-instrumental The Buckaroos Play Buck and Merle, which marries the 1965 LP The Buck Owens Songbook and 1971’s The Songs of Merle Haggard. Both will be released by Omnivore on July 23, shortly after local heroes Buck Owens and Merle Haggard are awarded honorary degrees from Cal State Bakersfield. Best known as Buck Owens’ guitarist, Don Rich was also an incredible fiddle player. And, while “Orange Blossom Special” was a live staple at a Buckaroos show, Don’s fiddle carried through to many of Buck’s studio releases, too. In 1971, ten tracks were compiled from a number of Buck Owens & The Buckaroos albums and released as That Fiddlin’ Man. The album was an instant hit with fans. Sadly, on his way to becoming Bakersfield’s next big country star, Rich was killed in a motorcycle accident in 1974. Out of print for decades, That Fiddlin’ Man will be reissued for the first time ever on compact disc. Omnivore has added ten additional instrumental tracks from the Owens catalog that showcase The Buckaroos, Don Rich and his fiddle. That amounts to 20 tracks of prime Buckaroos — taken from 13 different albums recorded between 1963 and 1970. 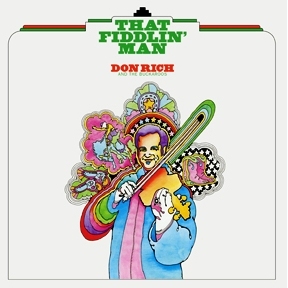 With a full-color booklet featuring new photos, liner notes from Rich’s family and detailed information outlining the sources of the CD’s 20 tracks, That Fiddlin’ Man is an essential piece of the Buckaroo puzzle, and a must-have for fans of Buck Owens and country instrumentals. When a young Merle Haggard played in Owens’ band, he suggested the name The Buckaroos for the combo. While Merle’s tenure with them was short-lived, he did pretty well for himself afterward. And The Buckaroos name not only stuck, but the band became almost as notable as its leader. Their playing became as noticeable as Buck’s distinct songwriting and delivery. Therefore, it was only natural that The Buckaroos’ first LP would be a tribute to their leader. The Buck Owens Songbook was released in 1965 and gave fans a chance to sing along with their favorite Buck hits with The Buckaroos as their backing group — lyrics provided. Six years and ten albums later, the band paid tribute on their last LP to the man who named them: The Songs of Merle Haggard appeared in 1971, and featured The Buckaroos’ instrumental take on classics like “Mama Tried” and “Okie From Muskogee.” That LP, unfortunately, didn’t come with a lyric booklet like its predecessor. It seems logical that these two releases should be joined together on one compact disc paying tribute to the leading pioneers of the Bakersfield Sound. The Buckaroos Play Buck & Merle features all 22 songs from both original LPs, and in addition to the words to the Buck songs, Omnivore will provide the lyrics to the Merle tracks, too. Factor in original artwork, rarely seen photos, plus reminiscences from surviving Buckaroos Willie Cantu, Doyle Curtsinger and Jim Shaw, and this is an indispensible document of Bakersfield country. Within the past year, Omnivore Recordings has also issued Buck Owens’ Honky Tonk Man, a compilation of unissued early ’70s recordings from the Hee Haw era, the 10” vinyl EP Buck Sings Eagles, plus Don Rich’s only solo album, the previously unissued Don Rich Sings George Jones.